Dr. Julie Kinn, Deputy Director of the Mobile Health Program at the National Center For TeleHealth and Technology, (@T2Health), chats with #SPSM about mobile health apps for service members, Sunday 11/9/14. SPSM will be featuring her as our guest expert to discuss how the Department of Defense is strategically designing technology tools for mental health. For an example of this work, check out this blog she wrote on their Psychological First Aid App. “The National Center for Telehealth & Technology (T2) is a component center of the Defense Centers of Excellence for Psychological Health and Traumatic Brain Injury (DCoE). In FY 2013, DCoE was aligned with the U.S. Army Medical Research and Materiel Command. “The mission of T2 is to lead the innovation of health technology solutions for psychological health and traumatic brain injury, and deliver tested, valued health solutions that improve the lives of our nation’s warriors, veterans, and their families. “Our vision is world-class health care and optimized health in the DoD through effective leveraging of behavioral science and technology. Julie T. Kinn, Ph.D. is a clinical psychologist and the Deputy Director of the Mobile Health Program at theNational Center for Telehealth & Technology (T2). 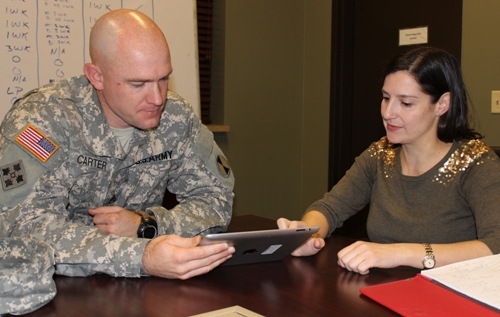 She oversees the development of mobile health applications to support the military community.